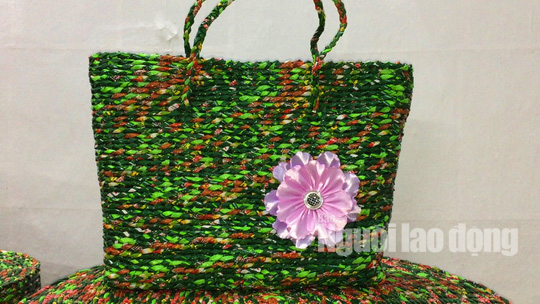 VietNamNet Bridge - Le QuocToan, an art teacher at Ly Thuong Kiet Primary & Secondary School in the southern province of Soc Trang, thought he could make ecologically friendly handbags after visiting a craft village famous for its water hyacinth products. Toan tried many materials but each attempt failed. At first, he used paper but it was not durable or water resistant. He then noticed that many instant noodle packs were being thrown away each day at the school’s canteen. As an art teacher, Toan found the packs colorful and useful. In 2014, Toan began making handbags from the material. It was not beautiful, but it was water resistant. Toan continued to experiment to make handbags, turning a deaf ear to criticisms. To date, Toan has made 44 handbags which have different colors and sizes. He has also made chairs, desks and boxes from instant noodle packs. The Vietnam Record Organization (Vietkings) recognized him as the person "who first made a collection of recycled bags from instant noodle packs with the highest number of products". To date, Toan has made 44 handbags which have different colors and sizes. He has also made chairs, desks and boxes from instant noodle packs. The Vietnam Record Organization (Vietkings) recognized him as the person "who first made a collection of recycled bags from instant noodle packs with the highest number of products". “When I received the proposal from Vietkings to provide additional information for the recognition, I bubbled over with joy,” Toan recalled. There are four phases of handbag production process: collection, cleaning, cutting and weaving. Some handbags are made of 500 packs. “You don’t need to have great health and high education level to make the handbags. You just need to have free time and patience,” he said. The most important goal of his work is educating his students about protecting the environment, he said. According to VACNE (the Vietnam Association for Conservation of Nature and Environment), the volume of plastic products created globally has increased by 20 times in the last 50 years. In HCM City, about 250,000 tons of plastic waste is generated every year, of which, 48,000 tons, or 19.2 percent, are buried at landfills, while the other 200,000 tons are either recycled or discharged directly into the environment. In related news, a group of young people from Hanoi have been travelling around the country, exchanging books for plastic waste to make eco-bricks. They call on the public to take action immediately for the future with no plastic waste.